I want to start off by introducing myself. I am Mrs. G! I know many of you have heard of me but not from me. And no, Jason was not making me up…I’m real. I am Mr. G’s silent partner in the food blogging world. So how did he get me to do a post? I don’t know, I haven’t figured that out yet but I am glad to do it. I have never done this before and I literally have no idea what I’m going to say but I will give it a shot. I am sitting here at my desk eating some leftover White Chicken Chili for some inspiration…it is just as good as leftover so that’s a plus! I’d first like to say that yes, I am very lucky to have married such a wonderful cook, but so is he! I too am a pretty darn good cook, I just don’t publish it for the world to see. I commend Mr. G for having done such an awesome job with Griffin’s Grub because to me it seems like a job (and it would probably interfere with the Real Housewives… of everywhere). To him, it is truly his passion and he enjoys every minute of it. I am very proud of my hubby! Now on to the recipe. It was a rainy weekend and we sat on the back porch contemplating what to make for dinner when I decided to dust off the old crockpot. Literally, I had to wash it because it was so dusty. It’s not something we use often but we do enjoy the convenience of a crockpot meal at least once a year. Not to mention the aroma that fills the house for 8 hours! White Chicken Chili popped into my head and I thought I’d give it another try. 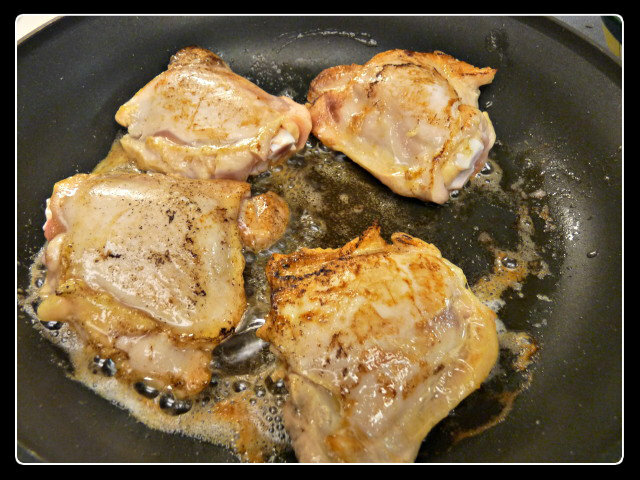 It is a recipe I have tried before with boneless, skinless chicken breasts (this time I used bone in thighs). It must not have been that memorable the first time because Mr. G didn’t remember me ever having made it. In his defense, it was about a year ago. Like I said, we enjoy using the crockpot at least once a year. As you all know, the Egg is in use the rest of the year. I first saw the recipe on Racheal Ray but I made a few minor adjustments. For instance, I don’t do beans in chili…even chicken chili. Hello, I’m from Texas! This time I used bone in chicken thighs. I removed the skin and browned them in butter for about a minute on each side. It really wasn’t necessary but I thought I would get some rendering from the bone before placing it in the crockpot. 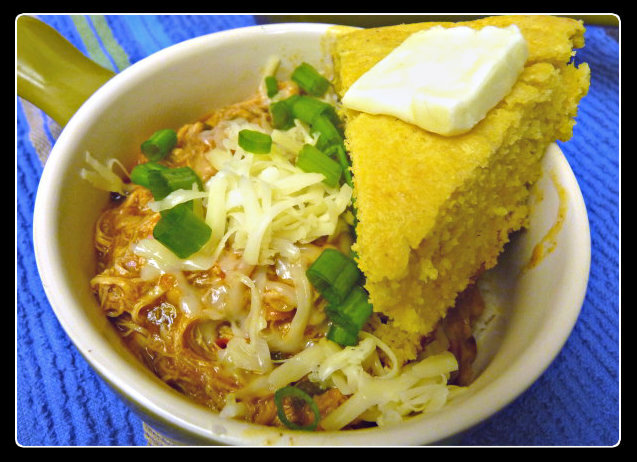 Next time I would probably bypass browning them…the whole point to an easy crockpot meal is throwing all the ingredients in and forget about it. Another thing I did a little differently was instead of using frozen corn, I used fresh corn that Mr. G kindly grilled up for me the night before. On the Egg, of course. I would have liked to have grilled up some fresh green chilis as well but unfortunatley I didn’t find what I needed on that shopping trip to the store. So back to the recipe…it’s so simple. 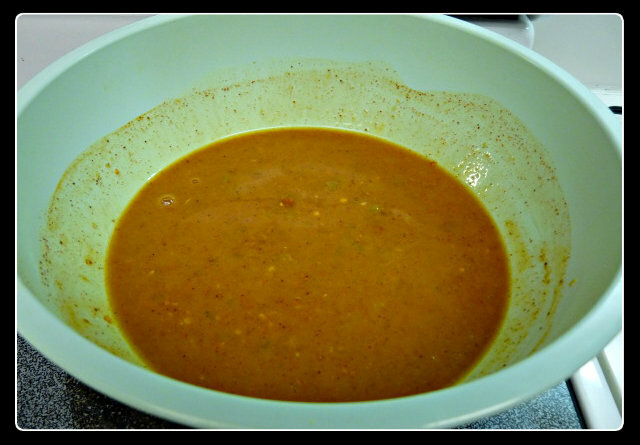 Combine the cream of chicken soup, green chilis, taco seasoning and chicken broth in a bowl. Set it aside until everything is in the crockpot. This will be poured over the chicken and veggies. I used low sodium taco seasoning as well as the soup and broth. Guess what, it needed salt. So if you do use the low sodium, salt and pepper to taste. 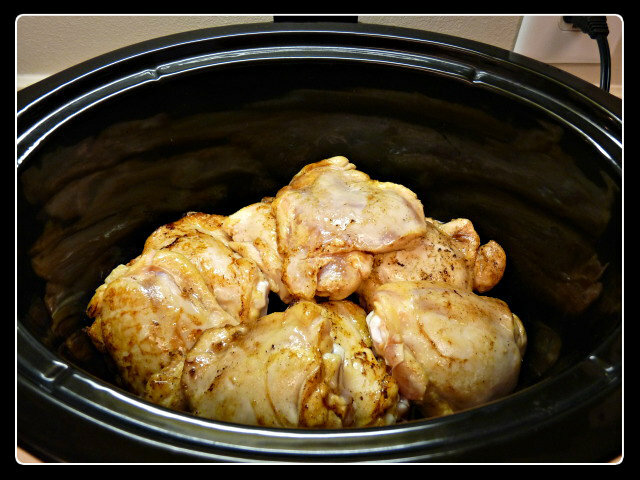 Place your chicken of choice in the crockpot. I did enjoy using the chicken thighs. It gave a great flavor from being on the bone. Remove the bones before serving. If you really want to use beans, I guess this would be the time to add them. 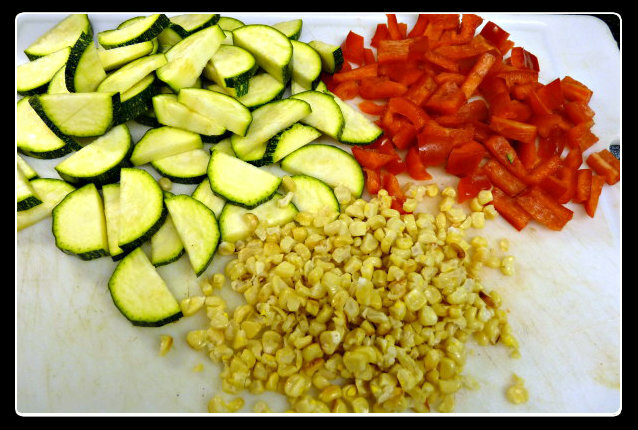 Dice the zuchini and red bell pepper. I like it a little more chunky because it cooks down so much. If you use fresh corn grilled corn, cut it off the husk. I only had one ear of corn on hand but I would use 2 next time. 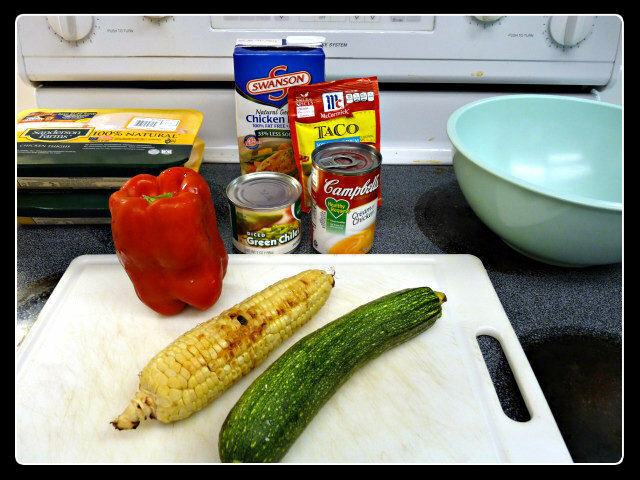 Then add the zuchini, red bell pepper and corn to the crockpot. 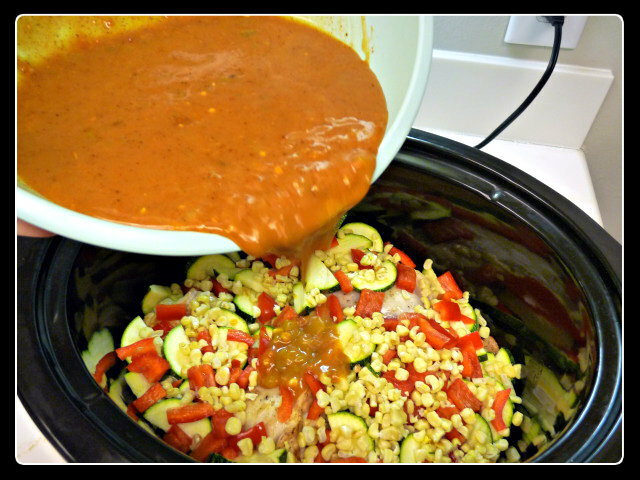 When everything is in the crockpot, pour the soup mixture on top and it’s ready to go! I cooked it for 8 hours on low or you can do 4 hours on high. After a long 8 hours or a short 4 hours, the chili is done. Mix in ½ cup of sour cream. I would use more like 1 cup of sour cream. 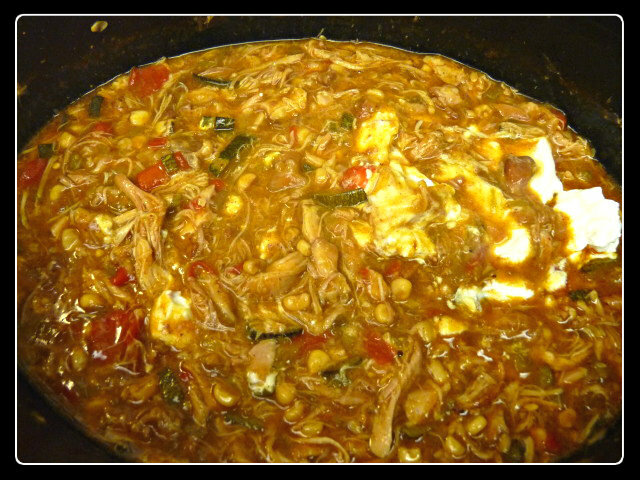 Maybe because I used bone in chicken, it was a little more liquidity and the sour cream helps to thicken it up. Top with cheese and green onions or cilantro and viola! I served my White Chicken Chili with white rice because I was too lazy to make Mama Reyna’s Spanish Rice (my friend Terry’s rice is the best!) but I promise to make it next time! Serve with your fave tortilla chips on the side. I think I will pick up some fresh tortillas on the way home, so we can have chicken tacos tonight! It would also be great for chicken nachos…yum, with a white cheese queso. Note: if you want to kick it up a notch, I suggest adding a little fresh jalepeno. That is one thing it needed…heat. There are definitely some Mexican spices that could be added to really give it more flavor. This is one of those recipes that you can easily play around with. It definitely needs more spice though. If you are interested in the cornbread (that was cooked on the Big Green Egg), check back tomorrow for that post. Well, that’s all I got! Thank you, honey, for letting me post on your blog. Sorry to all Griffin’s Grub followers if I wasn’t as interesting as my husband. Those are some big shoes to fill. Please keep coming back to read his blog! Maybe I will come back again and post something that’s more me…unless I’m watching the Real Housewives of somewhere. I totally understand! Honestly, I’m not much of a bean fan. I make mexican style pinto beans…charro beans…that I love but and they simmer all day but that’s about it. Oh, yea! Hello Mrs. G! Every once in a while something you’ve cooked to go along with Griffin’s grilling has shown up in a photo and looks so delicious. I’m thrilled to be able to have the actual recipe for one of those dishes now! The chili looks fantastic. Texans never use beans so I’m not surprised by that, but I’d need to throw in a can of great northerns. Otherwise, this looks absolutely amazing. Thanks so much for sharing. Hi Mom Chef! I’ve heard many great things about you. Thanks so much for the compliments! I can’t wait to see how you make the recipe your own. That’s great! Let us know how you like it and what you do differently! Thanks so much for all the wonderful comments! 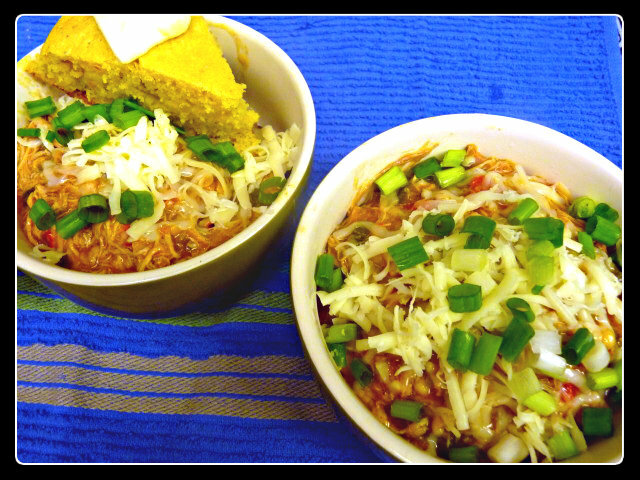 It was a quick easy dish and I didn’t know I would be writing a post about it. It was fun though. Jason has posted some of my dishes in the past (mostly my casseroles) but I will definitely do this again with some of my favorite dishes! Awesome post! Totally going to make this, maybe this weekend with my mama’s Spanish rice. (aka Mama Reyna’s rice) You reminded me to take out my crockpot and cook some short ribs this morning. Made for a yummy lunch. Nothing better than coming home to your house smelling delicious and everything is in 1 pot. Mrs. G, I think your chile looks divinely amazing. And I would eat 2 bowls. This is a much more rocking version of the one we use. I can’t wait to try this one, sounds just like the kind of thing I will love.